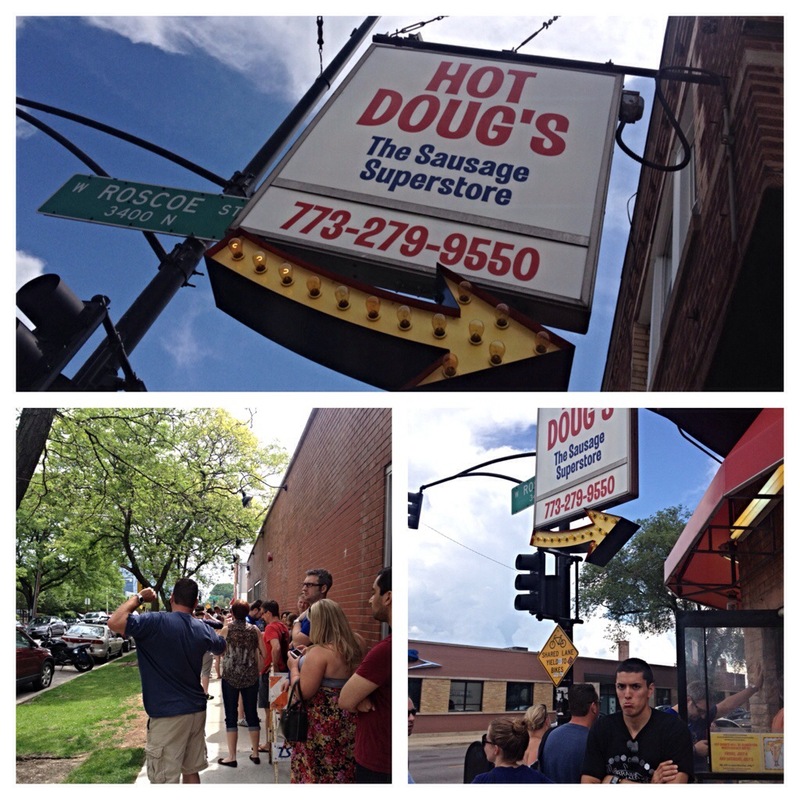 When I heard that Hot Doug’s, the Sausage Superstore and a Chicago institution, is closing on October 3, I felt discouraged that I might not get to go. Weeks ago, my sister-in-law, Melissa, and brother Chris asked if we’d like to go together. Last Saturday we went. Here’s a (shortened) play-by-play of our experience–the 3.5 hour version might take awhile! Today is the day. Our pup George woke me up at 6:45 am. I was showered and ready for some encased meats by 10:30. 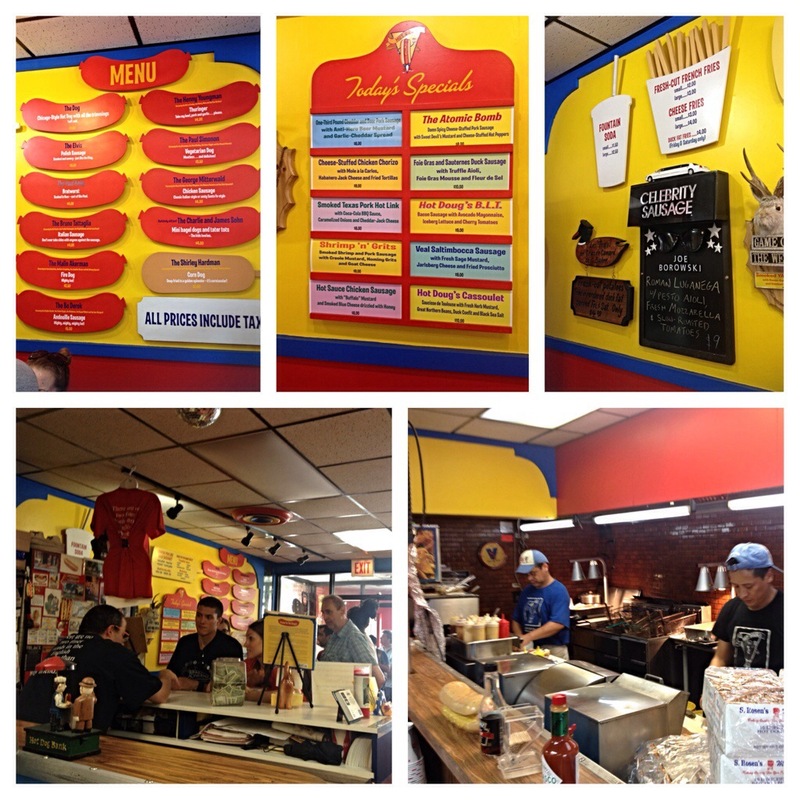 10:30 am: Go to the ATM because Hot Doug’s is cash only. Chris and Melissa pick us up, and we head north. 10:54 am: We arrive at Hot Doug’s. On California we only see a short line…then we turned the corner onto Roscoe. There they are: a line of people half a block down. 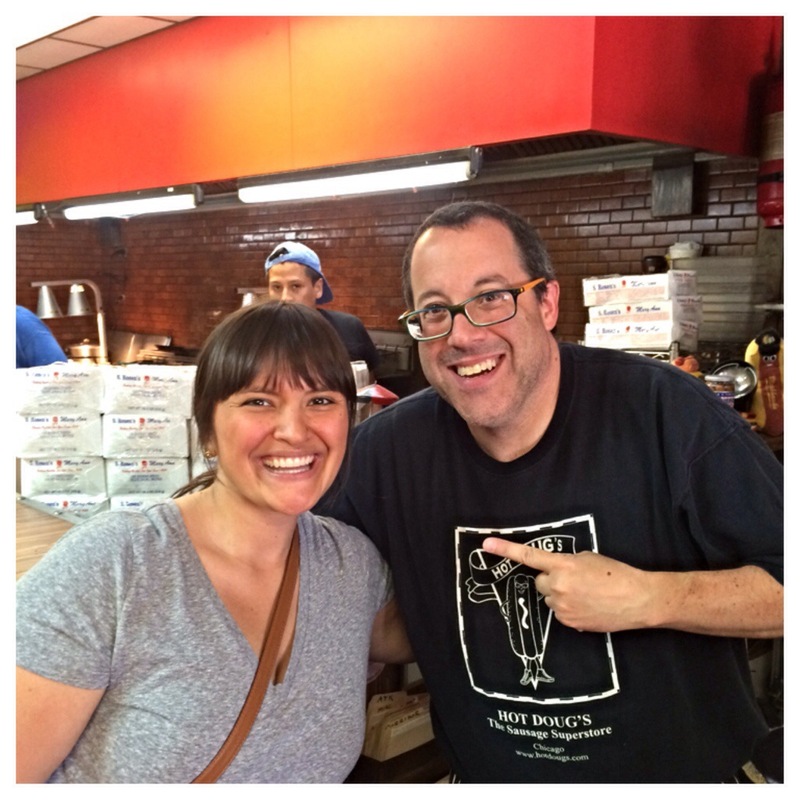 Mind you, Hot Doug’s opened at 10:30 am. 11:15 am: I’m already restless. I walk over to Target a few blocks away. I needed a drink (Gatorade). And a snack (a banana). I walk back. Noon: The sun is so hot, we get an umbrella from the car. The restaurant is giving hose water to those who need it. The ice cream truck is parked, and people can’t get enough water and ice cream. 2 pm: We are in the restaurant. It’s small, but strangely quiet and peaceful with lot of memorabilia, a very different scene from outside. If the line outside was hell, this is heaven. I’m staring at the menu; this sausage superstore has so many choices, like Polish, Bratwurst, Chicken, Italian, and vegetarian, plus daily specials like The Atomic Bomb, Shrimp ‘n Grits, and Hot Doug’s BLT. I’m salivating. Not only do you choose your sausage, you can choose how you want it cooked (chargrilled, boiled, or fried) and your toppings. 2:30 pm: We order with Doug. This man is so nice. If you dislike him or behave badly to him, there’s something wrong with you. Same goes with the rest of the staff. I get the chargrilled bratwurst with caramelized onions and ketchup. 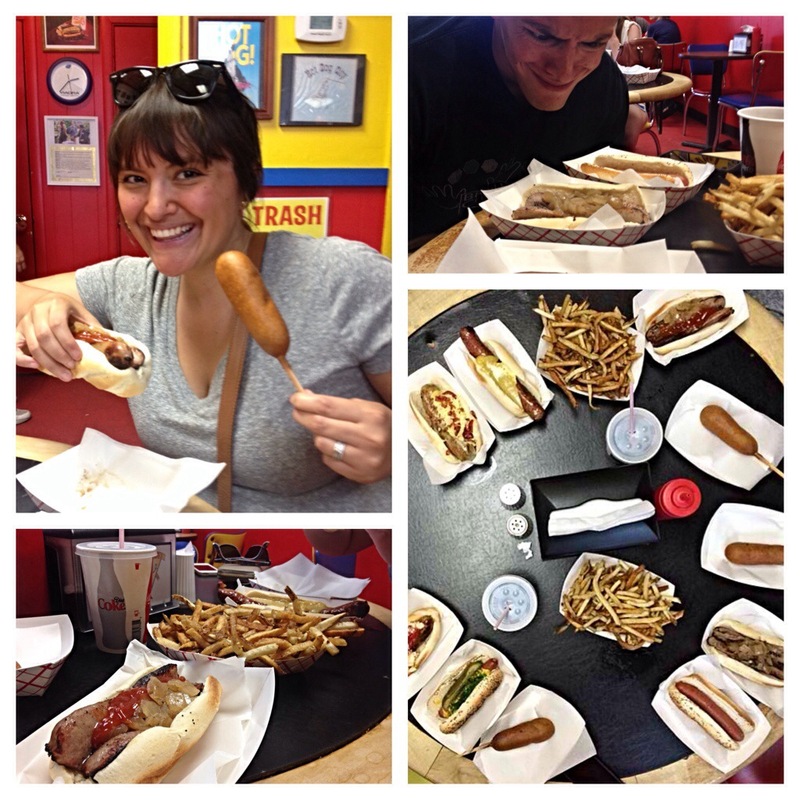 I know this isn’t the most adventurous order (I leave that to my hubby), plus my first-ever corn dog (they’re kind of sweet? Who knew? ), and duck fat fries to share. Nate gets three specialty dogs: One Third Pound Cheddar and Beer Pork Sausage, Hot Sauce Chicken Sausage, and Veal Saltimbocca Sausage. So, the ultimate question: Was it worth it? If you would have asked me while I was sweating in the hot summer sun, I would have said no. But once we got inside, I was so glad to be there. The end is near for this gem, and I can say I’ve been there, I’ve endured the line, and honestly enjoyed the delicious food. Oh, and I took my picture with Doug! (Did I mention how nice he is?) That said, I think this is a once-in-a-lifetime deal, and I’m okay with that. Just so glad I was a part of legacy. Ooh I love all the colorful pics! And I’m a big fan of the diary-style post!